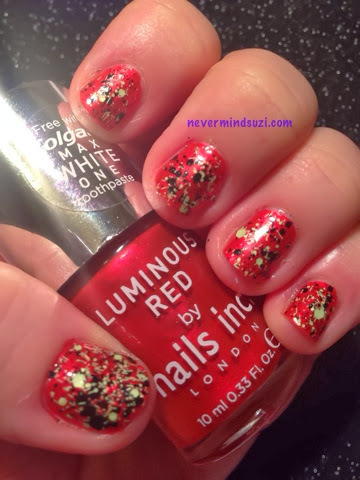 Today I'm wearing a limited edition (I got it when I bought Colgate toothpaste) Nails Inc - Luminous Metallic Red topped with Maybelline Boom Box Black. 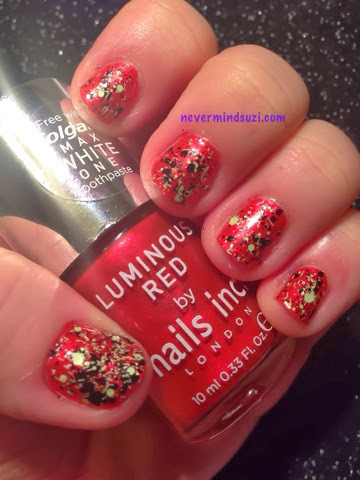 The red is a typical metallic red, it's pretty and a good formula but tbh it's nothing special. Considering the toothpaste was a lovely shade of blue I think they'd have been better to go with that. Boom Box Black by Maybelline is one of their new Street Artist glitter topcoats. Despite what the name suggests this isn't solo black, there's a lovely green (lime?) in the mix. So we've got glitter, bars and large hexes in black and lime green. 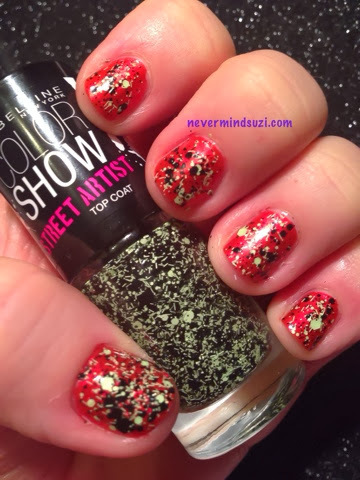 The glitter definitely saved this mani! oh i've heard of this line before and now i want it so bad! how does it look if you only layer a small amount? this blog is adorable, come join mine too, we have challenges! :) I was subbed already but we can make a links swap and stay connected if you want.